Trimble is shipping FREE displays for its laser tools as part of a new merchandiser program. 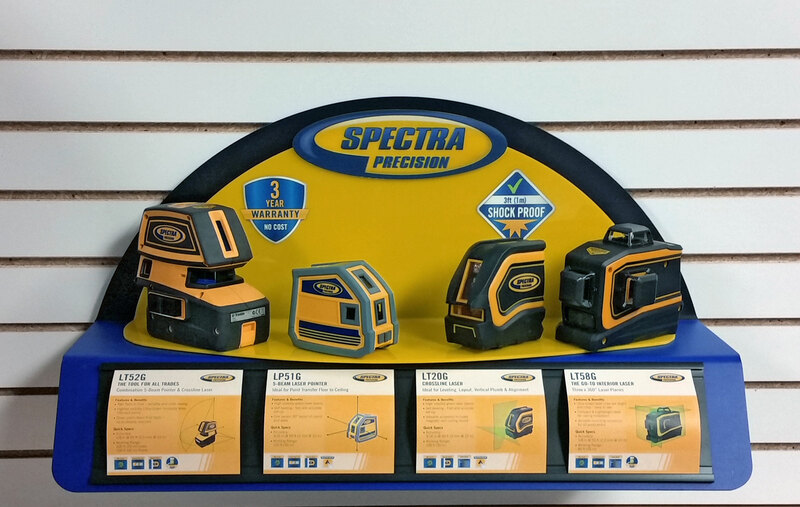 Part of a promotion running October 1st –November 16th, 2018, these new displays highlight the Spectra Precision Laser Tool portfolio and are designed to increase sales. Discount pricing is available at various quantity levels. Each display holds four laser tools, and also stores information cards for the entire laser tool product line – both red and green beam lasers. The display is compact, measuring 27” x 15” x 10”, and includes mounting hardware for slat wall or peg board. It can also stand alone on a counter or shelf. Thumbscrews are used to secure each instrument to the display. Please ask your account manager for more details and to get the promo code.